There’s a new invention on the horizon that could decrease air pollution, reduce traffic congestion, promote physical fitness and bring us all a little closer together. Perhaps you’ve already heard of it? Well, that’s understandable. According to a recent issue of UTNE Magazine, the only working prototypes seem to be in Canada. Perhaps you’ve heard of Canada? No? The innovative pedal-powered sofa, or couchbike, is the brainchild of mechanical engineer Brent Curry and his Norwegian sidekick, Eivind Meen (www.bikeforest.com). The pair took a rather nondescript, 95-pound sofa, attached wheels, brakes, two pedal-operated chain drives and a side-mounted steering mechanism and headed for the open road, sometimes hitting speeds of 27 mph (downhill) and drawing the attention of at least one Canadian constable. My question is, are we going to let Canada monopolize the pedal-powered sofa market? I think not, amigos. This idea belongs to the world (and you know it’s going to be big in Berkeley). Think about it. The couch bike uses no fossil fuels. It’s comfortable, roomy and inexpensive to operate. If you become fatigued during a long trip, you can just pull over, stretch out and snooze until your resolve is restored. 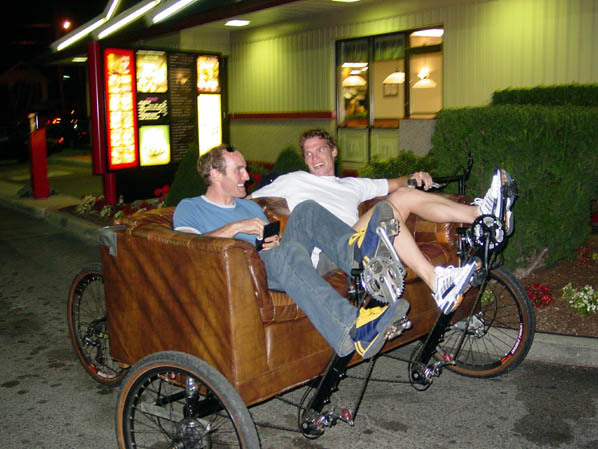 Not only will the pedal-powered sofa help cut national petroleum consumption, it will also contribute to the beautification of America, getting all those ratty, discarded couches off the roadside and into America’s 21st century transportation pool. No longer will derelict sofas litter empty lots and the sidewalks in front of fraternity houses. They’ll be reborn as much sought-after sport utility sofas. Best of all, couchbikes should be just as easily customized as any automobile on the road today. You could, for example, go for the full-sized luxury sofa or strap yourself into a sporty, low-slung loveseat. Add some fog lamps, chrome wire wheels, a stereo and extra-large cupholders and you’re on your way to becoming a local street legend. Yesterday you may just have been another couch potato from Oroville. Tomorrow you could be the king of the Sunset Strip. These are, like, much cooler than your uncle Wilbur’s 37-foot motorhome with the stuffed Chihuahua in the back window. Couchbikes should lend themselves to a wide variety of activities – exercise, travel, shopping and, if you and your cycling sweetie are feeling a little romantic after an idyllic ride through the countryside, hey, you’re already on a sofa, right? Just find a secluded spot and try not to scare any nearby livestock. Somewhere between Muskogee and Mississauga, in that gray area between Merle Haggard and Sid Vicious, a bold new musical style has erupted with its heart in Toronto and its soul in Vacaville. The music’s called cowpunk, the motto is “May the Twang be with you!” and the musicians are Toronto’s pretty-well-known-in-the-neighborhood Yeehaa Cowboys. This is not your father’s punk band, amigos. Performing together since 1996, the four-member band (five, if you count the vampire), has just released its first CD, “Cowpunk Baby, Cowpunk!” on Canada’s Rumenal Records label. And while the music comes from the Great Frozen North, the cowpunk sound owes much of its distinctive flavor to Vacaville, although nobody seems to know exactly why. Fact and fiction get kind of intertwined here, but Vacaville apparently became part of the cowpunk mythos when one of the group’s vocalists (either in the script or in reality or, possibly, both) disappeared during a bizarre fishing expedition and was last seen in Vacaville with somebody known as Satan Elvis. The concept of Twang, as evinced in “Vacaville,” is at the very core of the cowpunk sound. Sorry. The Yeehaa Cowboys are much more than a Bushmills-induced hallucination. Cowpunk is real. It’s here (and there) and it’s now. And if you don’t believe me, try checking out the Web site at http://www.mp3.com/yeehaacowboys. Toronto: Hey, we’re having some fun now! Summer’s drawing to a close and major metropolitan areas from Minneapolis to Moscow are casting wide nets for last-minute tourists, boasting first-rate entertainment, state-of-the-art transit systems and pristine park lands, along with lovable locals who are friendlier than the munchkins who trotted out to greet Dorothy and Toto. Whether it’s San Diego or Sarasota, community boosters are rolling out the red carpet to attract tourist dollars, touting the best and brightest their cities have to offer. Although folks in Toronto are justifiably proud of their hotels and theaters, they also take pride in some attractions that might not immediately pull in the average summertime sojourner from Scranton. According to the city’s latest tourism news letter, Toronto is the place to be if you fancy the latest in moose art, hippopotamus transit, gross bodily functions and a historical look at Canada as viewed through its footwear. Let’s start with those moose. “Everyone on the tour gets goodies including a pair of moose antlers to wear during their adventure,” enthuses the Toronto Briefs newsletter. Toronto moose mania continues through October. “It’s a fun, interactive and educationally stimulating exhibition explaining exactly how and why the body creates all that oozy, mushy, crusty, scaly and stinky stuff,” Toronto tourism authorities report. The grossology exhibit continues through Sept. 4 at Ontario Place. If you can’t make it to Toronto by then, I can probably direct you to a tavern in San Pablo which has a similar exhibition nearly every Friday night. You’ll have to leave the kids at home, though. Once you’ve been thoroughly grossed out, consider an excursion on one of Toronto’s stylish new “hippo” buses. The new, specially-designed hippos are built to carry up to 40 adventuresome passengers on amphibious tours of Toronto. They’re even available for private charter. Yes, all too often we think of Canada as nothing more than our big buddy to the north, not giving a moment’s consideration to the footwear that won the wilderness.